Washington – CNBC host and conservative commentator Larry Kudlow denied on Monday that he has decided to run against Sen. Richard Blumenthal, saying he is still mulling over whether he will challenge the popular Connecticut Democrat. “I have not made any final decision,” Kudlow said. A former Reagan-administration official and Bear Stearns chief economist with residences in New York and Connecticut, Kudlow called Post reporter Fred Dicker “a good man. The story was based on anonymous sources. The Connecticut Republican Party did not return phone calls requesting comment. 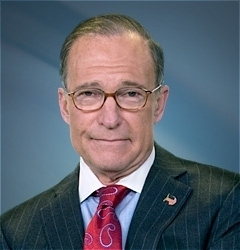 In early summer, Kudlow said he would run against Blumenthal if the Democratic senator supported a nuclear agreement with Iran. After much deliberation, Blumenthal supported the deal. Blumenthal has used the threat of a challenge from Kudlow to raise campaign money through blast email solicitations. “It’s never good news when The New York Times says a right-winger might raise up to $30 MILLION to defeat you,” said a Blumenthal fundraising letter released last week. Kudlow would likely to have to give up his radio and television programs if he runs. That may a financial loss he’s not willing to take, some analysts say. Kudlow would face a GOP primary challenger. August Wolf, a Stamford businessman and former Olympic shot putter is also seeking the Republican nomination to run against Blumenthal. Like Kudlow, Wolf has been highly critical of Blumenthal’s stance on the Iran pact.